A space to hold the daily stand-up, near where the iteration or kanban board and graphs are prominently displayed. Space to sit side-by-side at a computer, rather than having to look over someone’s shoulder, cramped in their cube. Desks that have a long, straight edge, or slight outward curve, work best. Rolling chairs are great, but should not be too bulky. Whether or not your teams will be doing pair-programming, you must avoid restricting collaboration. Cubes are innovation-constraints. Plenty of available whiteboard space for brainstorming (not already used for charts). A space to hold an ad hoc team meeting, without having to reserve a conference room. Just think: If the team can hold all of its own meetings in its own space, that will free up the conference-room schedule for the execs. Whenever I see a dozen people get up and run out of a cube farm, only to file into a small conference room, I have to laugh…sadly. Only the manufacturers of cube walls are happy with this arrangement. 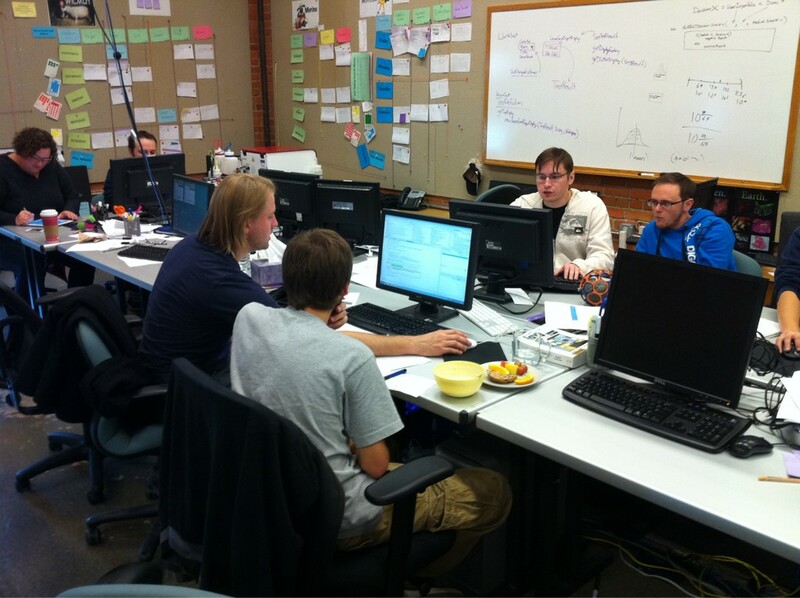 Sound-blocking walls or dividers to separate the team from other teams or co-workers outside the team. A team must be able to be noisy when necessary. If you’re breaking up a huge open floor, consider hanging those architecturally interesting glass dividers above a half-wall. This gives teams plenty of light from windows without having to listen to the neighboring team’s release-retrospective party. All of the above need to be incorporated into the same space, not spread out. A meeting could be held by having everyone turn their chairs. A brainstorming session between two developers should allow others to tune in, or tune out, without leaving their workstations. You can easily prototype a team-space design: Within a single walled-off room, start with one team, fold in some folding tables, and toss with a few rolling whiteboards. Then wait and see how the team chooses to arrange their own furniture. Often, the teams remain happier with the folding tables than with prefab, fixed-position desks. They like to be able to convert the space to meet any occasion, such as a theater for Thursday evening movie night. Space to hold a private conversation with a colleague, or to call home, or to feed a baby. This does not, however, need to be a personalized cube, one per person. It can be a shared space with a sign-up sheet. It needs to have a door to close and block out the rest of the team. A table or shelving unit for snacks, books, and other sundry items. Note that I left these last items out of the “complete team space” list. These last few ingredients could be incorporated into the team-space, or not: As long as they’re within a short walk, we have provided an opportunity to get up out of our chairs. Keep these to a minimum, keep them portable (in a purse or backpack), and set them up wherever you’re working each day. I encourage teams to have a team library (perhaps with the snacks). Write your name on the book and add it to the library. Remember: We’re at work to work. It should be a place we want to go, to have fun collaborating with our colleagues and creating innovative solutions. Not a place so painful that we need to distract ourselves with photos of Maui, or Foosball. 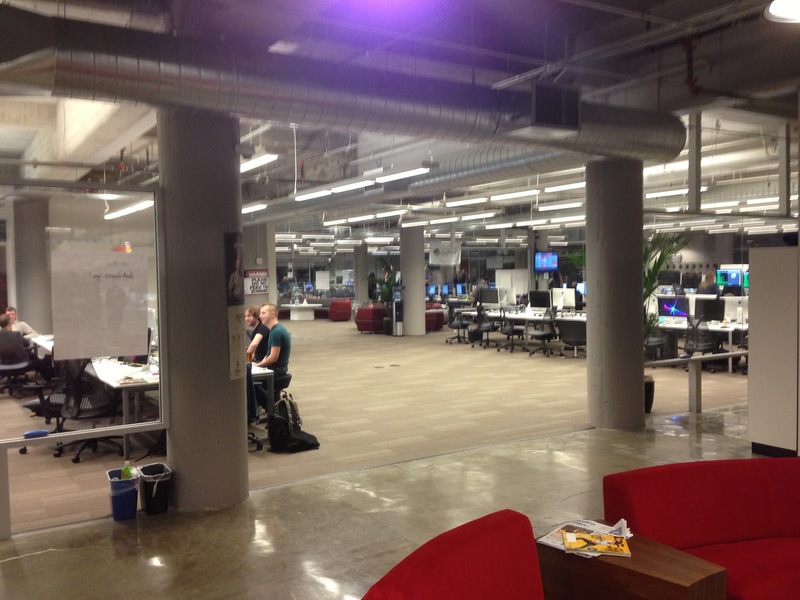 The huge, elegant team spaces at the Pivotal Labs building, San Francisco, CA. I arrived about 30 minutes before taking this picture, and the place was packed with enthusiastic, happy developers. A bell rings at 6:15pm each day to remind people to go home. I was asked to take this from a distance, and towards banks of logged-out workstations, to assure that client IP was protected. Rest assured, each station had at least one huge screen and comfortable seating for two. I love that. I also love the idea of using mobile furniture to let the team figure out what works best for them. Our small conference room has white board built in on all four walls, its very handy that way because you can orient the room anyway that works for you. I would reconsider using glass as space dividers. I live in a glass cube with a sliding glass door after having a real office in our old building. The sound travels so much in our new offices that everyone either spends all their time with headphones on or run fans (I wear a sweater in the summer in my office so I can run my fan) or have music playing softly to block out hearing every word said in the hallway or in the conference room. I speak to my co-workers way less often in person and more on IM even though they are a few steps away because of the noise factor. I think it makes truly working as a team harder if you need face-to-face interaction. Good stuff. Thanks for writing this up, Rob. Great post, and I appreciate the photos. Years back (before I knew anything about Agile), I realized that the cubes were killing our collaboration. I instructed everyone to redesign the site and they went nuts! The final result? Productivity shot through the roof. It works!